The GEE User Summit is an annual technical workshop where users can share their experiences and applications, collaborate for research, develop tools, and generally keep abreast of new functionality and features of the rapidly developing service. 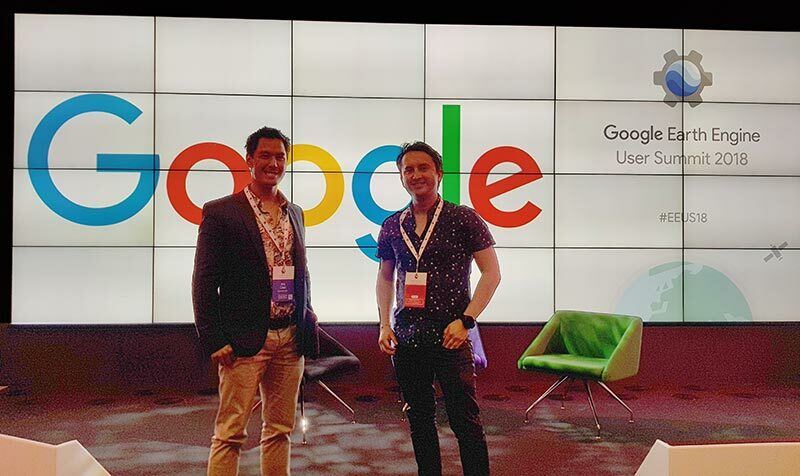 This years GEE User Summit was hosted at the Google Offices in Dublin, Ireland. ~250 international researchers, practitioners and developers participated in a series of multidisciplinary and inspirational topics covered by 2 plenary talks, 34 breakout sessions, 10 hackathons and 25 lighting talks. To catch up on all material, slides and links to recordings will be made available on the Agenda section at the Summit website. Fig 2. Recording of the plenary talk by Rebecca Moore (Director of Earth Engine, Earth and Earth Outreach) illustrating the basis, impact and future directions of the Earth Engine. On behalf of King’s Earth Observation and Environmental Sensing research hub, Alejandro and Kris contributed 3-min lightning presentations on the recently available integration of Tensorflow (Alejandro), and new change detection method LandTrendr (Kris). Recordings of both presentations will be also available soon at Earth Engine User Summit 2018 site. “The GEE summit was a positive and outstanding experience. I was very inspired by every talk and technical session attended. The world-class facilities at the Google venue as well as the ‘good vibes’ by all attendees and Google developers were key aspects to encouraging a thoroughly enjoyable three-day workshop. My main highlight was the announcement of the integration between Tensorflow and GEE, allowing to explore a next generation of remote sensing based on emerging data-driven methods such as ‘deep learning’ architectures. The timely announcement allowed our hackathon team to better explore the intricacies of the tool, including in remote-sensing related applications. “Google continues to advance the field of remote sensing through GEE. 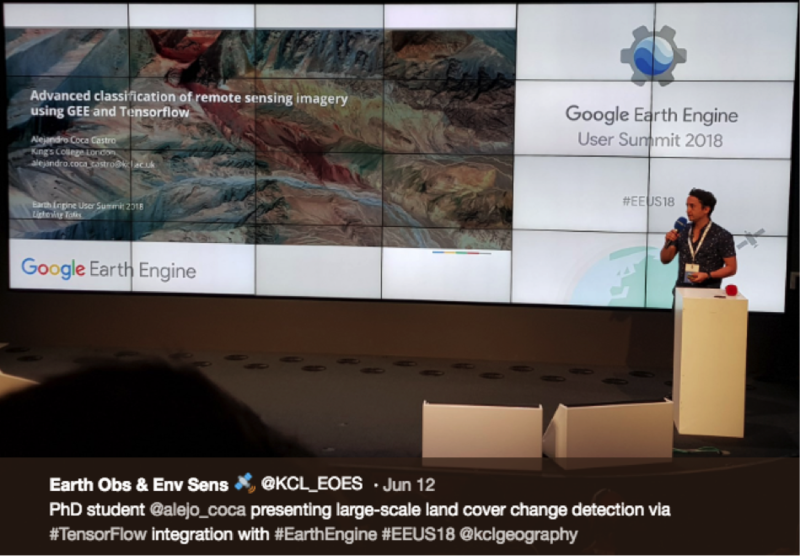 However key considerations exist before committing to the platform, and I was pleased to see many researchers and the Google team seeking to identify and address these at EEUS18. With the addition of the LandTrendr algorithm just days before the summit, I pivoted my talk to give a practical example of its usage in GEE, in addition to discussing how to improve land-use classification in seasonal or agricultural environments. I vastly enjoyed my hackathon, which was aimed at improved detection of surface water-bodies utilising multiple sensors. Our team managed to obtain samples from Sentinel-1 and 2 imagery for known temporary water bodies in Alberta, Canada, for future supervised classification across the broader Alberta region. Alejandro and Kris are grateful to the Geography Department and EOES research hub for providing support for attendance to the GEE summit. We would additionally like to thank the Google team for the brilliant organization of this user conference and for inviting both speakers to provide lightning talks. 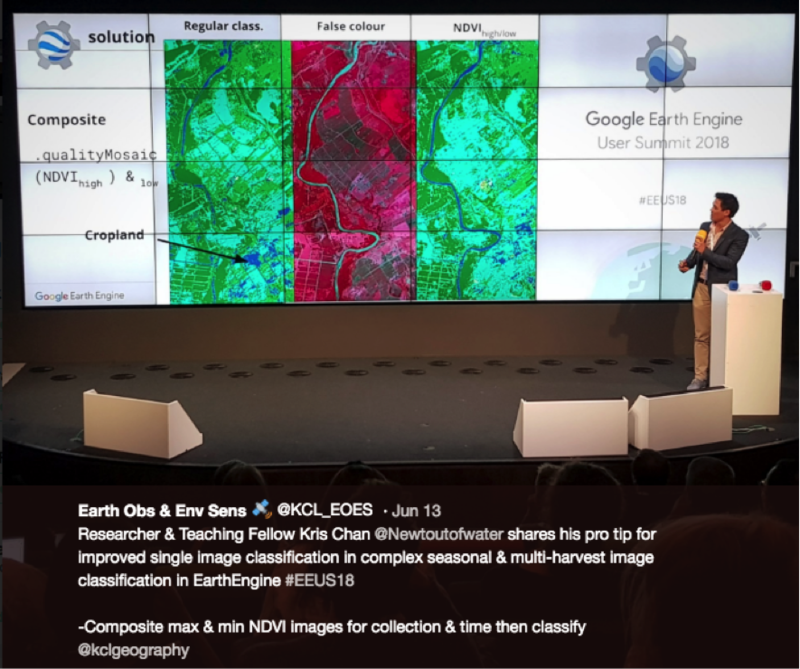 This entry was posted in Conference reports, Earth Engine, Earth Observation, Land change, Landsat, Machine Learning, MODIS and tagged cloud computing, earth engine, Earth Observation, LandTrendr, Remote sensing, satellite image, Tensorflow by Alejandro Coca Castro. Bookmark the permalink.